BACKGROUND AND PURPOSE: Primary angiitis of the central nervous system of childhood (cPACNS) is a rare and ill-defined disease. In the absence of a brain biopsy, the diagnosis is based on typical clinical and imaging abnormalities. The aim of this study was to analyze systematically the MR imaging and MR angiographic (MRA) abnormalities in a large cohort of children with cPACNS. METHODS: We analyzed the MR imaging features of a single pediatric center cohort of 45 cPACNS patients. MR imaging studies were performed for all patients, and both MR imaging and MRA were performed for 42 patients, who formed the cohort for review of the presence and correlation of lesions. Proportions were calculated by using the Fisher exact test, and agreement between MR imaging and MRA was calculated by using the McNemar test. The sensitivity of each diagnostic technique was established. RESULTS: The most-common pattern of parenchymal abnormality was multifocal, unilateral involvement, each in 42/45 patients (93%). 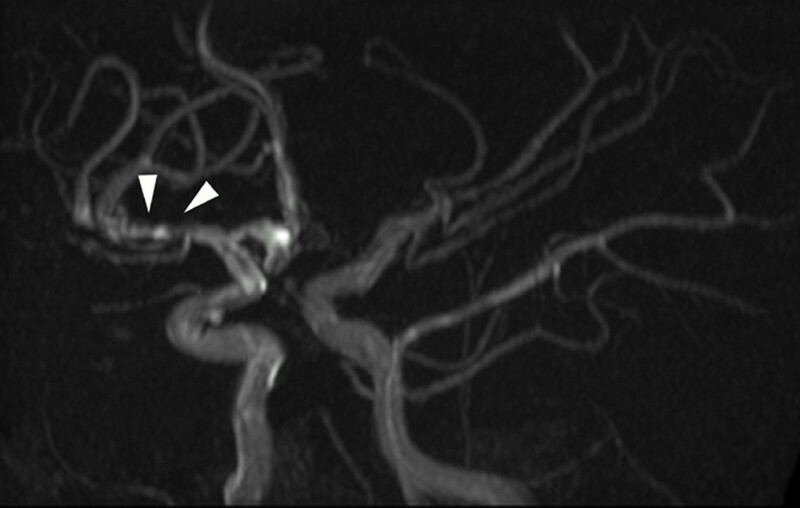 The lateral lenticulostriate artery terrritory was affected in 56% of cases, with involvement of a supratentorial deep gray matter structure in 91%. No infratentorial lesion occurred in the absence of supratentorial abnormality. MRA was normal in 12/42 patients (28.6%). Among the abnormal studies, stenosis was detected on MRA in 83% and was “benign” in appearance in 73% of patients and “aggressive” in 16.7%. Involvement was proximal in 83% and distal in 27% of patients. Multiple ipsilateral lesions were seen in 63%. MR imaging was abnormal in every patient where MRA was abnormal. With the assumption of MR imaging as the gold standard, the sensitivity of MRA was 72%. The agreement between MR imaging and MRA for abnormality was significant (P = .04). CONCLUSION: We have illustrated the MR imaging and MRA appearances of cPACNS in the largest cohort to date. Both parenchymal and vascular lesions were predominantly proximal, unilateral, and multifocal within the anterior circulation. There was good agreement between MR imaging and MRA for lesion location. MR imaging findings were abnormal in all cases at diagnosis, and this remains the most sensitive technique to the detection of vasculitis. CNS vasculitis in children is a heterogeneous group of conditions. Frequently CNS vasculitis occurs in the context of a systemic vasculitis, systemic disease, infection (eg, postvaricella angiopathy) or postradiation vasculopathy. CNS vasculitis must be distinguished from noninflammatory vasculopathies, including dissection, Moyamoya, sickle cell disease, migraines with vasospasm, and rare metabolic vasculopathies.1 Primary CNS angiitis in children (cPACNS) is rare. The diagnosis may be suspected when suggestive clinical features, including newly acquired focal or diffuse neurologic deficits, are present. The confirmation strongly depends on radiographic appearances of the brain on MR imaging and cerebral vasculature on conventional angiography (CA). Although CA is considered the gold standard, because of its invasive nature it is less frequently performed than MR angiography (MRA) in many centers. Radiographic appearances of adult patients with PACNS have been reported elsewhere.2–8 In children, no systematic reviews of cPACNS patients have been performed and no defined radiographic criteria are available. The primary aim of this study was to determine the distribution of parenchymal and vascular lesions of cPACNS on MR imaging and MRA at diagnosis. A secondary aim was to explore the correlation between MR imaging and MRA abnormalities. A single pediatric center retrospective cohort study of children with cPACNS diagnosed between January 1, 1990 and December 31, 2001, was performed. Patients were identified by searching for the diagnostic terms “CNS vasculitis” or “CNS angiitis” in the Hospital for Sick Children (HSC) Rheumatology data base and the Canadian Pediatric Ischemic Stroke Registry (Toronto site) and cross-referenced by the international classification of diseases-9 code searches for the discharge diagnoses “vasculitis,” “CNS vasculitis,” and “CNS angiitis” in the HSC health records data base. Inclusion criteria included (1) clinical diagnosis of primary CNS vasculitis of childhood and (2) CA confirmation of suspected cPACNS. Exclusion criteria included (1) neonates, (2) significant underlying conditions or defined cause of CNS vasculopathy, including postvaricella angiopathy, sickle cell disease, Moya Moya, migraine, systemic lupus erythematosus, or other systemic vasculitis, or (3) lack of imaging. All patients underwent standardized sequential clinical assessment and neuroimaging. Sixty-six children were diagnosed with cPACNS. The clinical criteria used to diagnose cPACNS were the same as those used by Calabrese and colleagues4,9 and include new onset of an acquired focal or diffuse neurologic deficit and CA abnormality. Clinical presentations were categorized as headaches, seizures, focal neurologic deficits (hemiparesis, hemifacial weakness, hemisensory, and fine motor deficits), diffuse neurologic deficits (altered concentration, cognition, mood, or personality), and constitutional symptoms (fever, fatigue, weight loss). Laboratory parameters collected included (1) inflammatory markers (erythrocyte sedimentation rate, C-reactive protein, IgG, C3 complement), (2) hematologic tests (hemoglobin, platelets, white blood count), (3) prothrombotic testing according to published protocols, including lupus anticoagulant tissue thromboplastin inhibition index (TTI), platelet neutralization procedure (PNP) and, the dilute Russell viper venom time (RVV), (4) autoantibody profile (antinuclear antibody [ANA], antineutrophil cytoplasmic antibodies [ANCA], anticardiolipin antibodies [ACLA]), and (5) cerebrospinal fluid (CSF) abnormalities (CSF protein or CSF cell count, opening pressure, oligoclonal bands). Infections were excluded with viral and bacterial cultures, blood and CSF serology, and CSF viral polymerase chain reaction. Biopsy was not used to define the subset as justified in the discussion. At diagnosis, MR imaging was reanalyzed in 49/66 patients whose imaging was readily available. Four patients with biopsy-confirmed CNS vasculitis with negative angiography were excluded and are described elsewhere.10 The total number of patients reviewed was 45. All these patients had MR imaging scans, but MRA studies were available for review for only 42 of them. Therefore, for comparison between the 2 modalities, 42 patients who had both MRA and MR imaging at diagnosis were analyzed. The median age at initial MR imaging was 7.3 years (range, 0.7–16.5 years). There were 15 male patients and 30 female patients. Two study neuroradiologists undertook standardized review of all initial MR and MRA, based on review of vasculitis literature. All imaging was reviewed blinded to the clinical and laboratory findings and the clinically generated reports on the films. All assessments were conducted by consensus between the 2 reviewers. MR imaging was performed on a General Electric 1.5T superconducting magnet (Signa Echospeed, version 8.2.3, software; GE Medical systems, Milwaukee, Wisc). Minimum sequences included a T1-weighted (TR/TE, 600/20) and fast spin-echo T2-weighted (TR/TE, 2000/100) axial, and 3D time-of-flight (TOF) MRA (33/4.8; flip angle, 30; matrix, 256 × 256; and field of view, 14–15 cm). Magnetization transfer and zero-fill interpolation processing (ZIP) 512 and ZIP 2 were also used. In addition, earlier examinations included a proton attenuation (2000/30) and, after 1998, fluid-attenuated inversion recovery (FLAIR; 9000/100; TI, 2200) sequences were used. Diffusion-weighted imaging (DWI) and intravenous gadopentetate dimeglamine (0.2 mL/kg) enhanced scans were performed as supplementary sequences in many, and these results were recorded. 3D TOF was divided into 3 slabs with 30% overlap. Each slab comprised 64 partitions with an overall of section width of 1 mm. Coverage from the foramen magnum to the pericallosal artery was obtained. Maximum intensity projection (MIP) images were reviewed on hard copy and PACS (picture archiving and communications system). The number and appearance of parenchymal lesions were analyzed and compared on the following modalities: T1, T2, FLAIR, and DWI/apparent diffusion coefficient (ADC) mapping. For each lesion detected, the signal intensity abnormality, laterality, location (lobar, basal ganglia, thalamus, and white matter distribution), vascular territory, and gadolinium enhancement were determined. The vascular territory was allocated according to standard anatomic texts.11–13 The following definitions were made: periventricular lesions—white matter lesion contacts the ventricles; subcortical lesions—contacts the cortex; peripheral lesions—involving all 3 of deep white matter, subcortical white matter, and cortex; superficial lesions—involving cortex and subcortical white matter. Deep lesions were defined as involving deep gray, deep, and/or periventricular white matter. MIP MRA images were evaluated for stenosis. The vascular distribution of lesions was documented. Stenosis was measured by using the calibration markers on each image. Measurements were standardized by using the outer margins of the vessel wall. An assessment of stenosis was made by comparing the diameter of the affected segment of the vessel with the diameter of the nearest normal vessel segment. Beading was defined as alternating, short, regularly spaced segments of stenosis with short normal or dilated intervening segments. Involvement of a single vessel segment (eg, M1 segment, middle cerebral artery [MCA]) with multiple stenoses separated by a gap greater than seen with beading was recorded as “multiple.” For the purposes of measuring stenosis, the projection showing the tightest stenosis was chosen for each lesion. Lesions were classified as aggressive if 2 or more of the following morphologic features were present: irregular, eccentric, beaded, or multiple.13 Lesions were classified as benign in the presence of 2 or more of the following features: single, concentric, smooth, graduated. Lesions were defined as proximal if most-proximal segments of the anterior cerebral artery (ACA; A1) or MCA (M1) or distal (C7) portions of the internal carotid artery (ICA) were involved. Distal was defined as involvement of segments beyond the M1 or A1 segment. Hypoplastic was defined as an absent or diffusely smooth A1 segment of the ACA or posterior communicating segment. The same approach was adopted for the most-proximal segment of the posterior cerebral artery (PCA; P1) in a fetal PCA arrangement. The presence of aneurysms was documented. MR imaging and MRA lesions were considered to agree if the abnormalities present on the MR imaging were ipsilateral to an MRA abnormality and corresponded to the affected vascular territory. Sensitivity was calculated considering each technique as the gold standard. All data were transferred into a dedicated study data base. Proportions were calculated by using the Fisher exact test. Agreement between MR imaging and MRA was calculated by using the McNemar test. Sensitivity was calculated for each technique alternating as the gold standard (SPSS version 10; SPSS, Inc., Chicago, Ill). Abnormalities were seen on 44/45 (97.8%) of T2-weighted and 19/20 (95%) of FLAIR images. When both T2-weighted and FLAIR images were performed in the same patient, all identified lesions were seen on both modalities. Abnormalities were seen in 9/15 (60%) of DWI sequences/ADC maps performed including a single patient with normal T2 and FLAIR imaging (Fig 1). 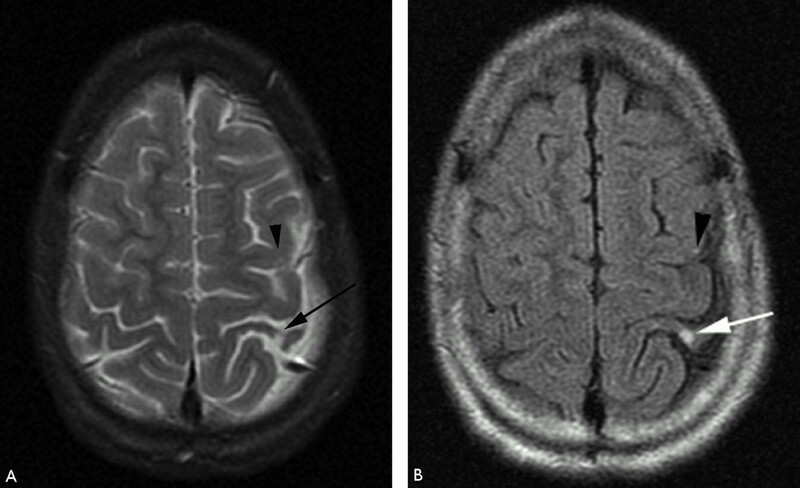 FLAIR (A) and isotropic (B) DWI MR images. Normal FLAIR imaging in the context of a 1-day history of right-sided weakness. DWI reveals restriction within the putamen and external capsule (white arrow). On initial MR imaging, 190 lesions were found. The mean number of MR imaging lesions per patient was 3.8 (SD, 2.8; range, 1–12). Seventy-three percent of patients had <5 lesions, with 3 (6%) having a single lesion. Twenty percent had 5–10 lesions, and only 7% had more than 10 lesions. Unilateral lesions (Fig 2) were seen in 93% of patients, there was no significant difference between sides. Bilateral lesions were present in 3 patients (7%; Fig 3). T2-weighted (A), FLAIR (B), and isotropic DWI (C) of a unilateral lesion in a patient with an acute or chronic presentation of worsening right-sided weakness. There are 2 T2-weighted hyperintense lesions involving the genu and posterior limb of the internal capsule (white arrow) and posterolateral putamen (black arrow). 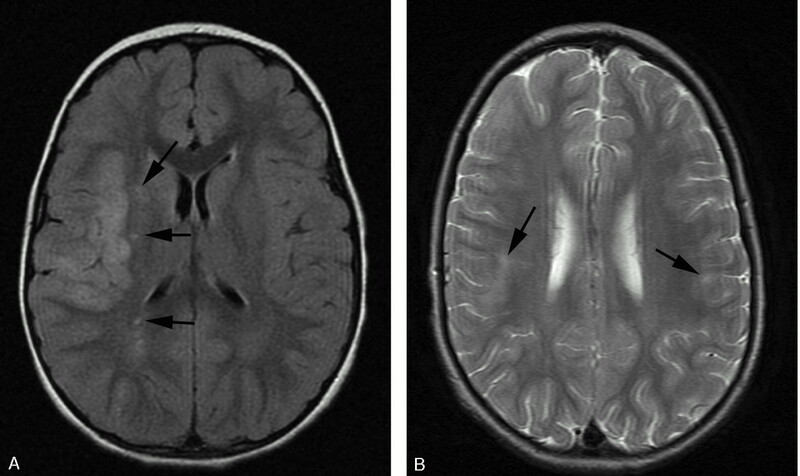 Both T2-weighted (A) and FLAIR (B) images reveal lesions of differing age with an anteromedial well-defined encephalomalacic cavity and a posterolateral lesion. The isotropic image (C) confirms a new focal area of infarction within the lateral lenticulostriate artery territory (black arrow) as an area of reduced diffusion. Fat-saturated T2-weighted MR imaging of bilateral lesions. There is T2-weighted signal intensity abnormality involving bilateral basal ganglia nuclei, thalami, subcortical, and deep white matter, greater on the right. The distribution of abnormality is consistent with both anterior and posterior circulation involvement. The vascular and regional distribution of lesions is listed in Tables 1 and 3. Most lesions were supratentorial 186/190 (98%). Only 3 patients had both infratentorial and supratentorial involvement (total of 4 infratentorial lesions), and none of the patients had isolated infratentorial lesions. There were no hemorrhagic lesions. Eight lesions had signal intensity indicating cavitation/encephalomalcia (Fig 2), presumably relating to a previous subclinical event. The distribution of the lesions was most commonly isolated to the anterior circulation distribution (76%) and was less frequently isolated to the posterior circulation (16%) or involved both anterior and posterior circulations (11%) (Fig 4). Involvement of the lateral lenticulostriate vessel supply (caudate, anterior internal capsule, and putamen) occurred in 25 patients (56%) (Figs 1 and 2). T2-weighted MR imaging. There is expansion and irregular hyperintensity within the right middle cerebellar peduncle extending into the right cerebellar deep white matter and dentate nuclei. Mild fourth ventricular effacement is evident (black arrow). The appearances are consistent with anterior inferior cerebellar artery (AICA) and perforator infarcts. In 21 patients (47%), at least 3 of the following were involved: caudate, putamen, internal capsule, and globus pallidum. Deep lesions were seen in 28 patients (62%). At least one deep gray matter structure was involved in 91% of patients (41/45). Superficial (Fig 5A) and peripheral lesions (Fig 5B) were seen in 10 (22%) and 8 (18%) patients, respectively. A, FLAIR demonstrating acute infarct within a superficial distribution. There is cortical swelling and hyperintensity and adjacent patchy subcortical involvement within the right MCA territory. 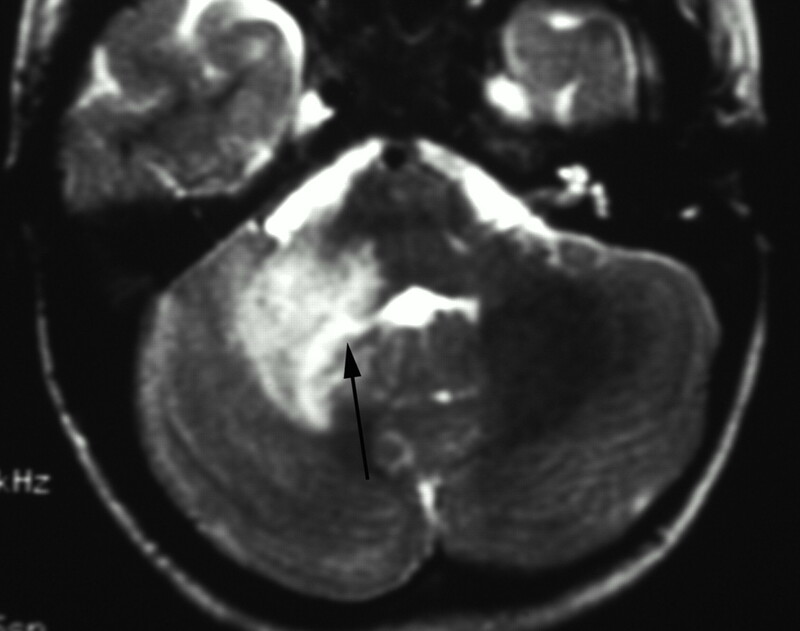 Additional punctate signal intensity abnormalities are present within the right external capsule and parietal deep white matter (black arrows). B, T2-weighted axial MR imaging demonstrating bilateral peripheral infarcts with hyperintensity within deep and subcortical white matter best appreciated within the right frontal lobe. Bilateral cortical involvement and left deep white matter involvement are appreciated more easily on FLAIR (not shown). Seven patients received gadolinium, and pathologic enhancement was seen in 5. Four demonstrated basal ganglia lesion enhancement with variable involvement of lentiform, corpus striatum, and internal capsule, whereas a single patient had multifocal bilateral parenchymal enhancement. No leptomeningeal or perivascular space enhancement was seen. Thirty patients had abnormal MRA studies (71%), harboring a total of 76 lesions (median, 2; range, 1–5). The remaining 12 patients had abnormal CA with normal MRA. The vessel distribution is listed in Table 2. Involvement was isolated to the anterior circulation in 24/30 patients (80%), posterior only in 3 patients (10%), and both anterior and posterior in 3 patients. Proximal involvement of any or all of the A1, M1, and C7 portion of the ICA occurred in 25/30 (83%) patients (Fig 6). Distal involvement occurred in 8/30 patients (27%). Multiple ipsilateral involvement was seen in 19/30 patients (63%). Four patients (12.9%) had >3 areas of ipsilateral involvement. Bilateral lesions were seen in 6 (20%) patients. Collaterals were suspected in one patient. Time-of-flight MRA maximum intensity projection (MIP) viewed from posteriorly. The posterior circulation has been removed. There is smooth, regular, concentric, distal left internal carotid and proximal prebifurcation M1 segment flow attenuation (white arrowhead) resulting in reduction in flow signal intensity from remaining MCA branches (white arrow). The A1 segment of the ACA is unaffected. The pattern of proximal involvement was seen in >80% and the “benign” morphology was seen in half of patients studied. Stenosis was present in 25/30 (83%) patients with an abnormal MRA (72/76 [95%] lesions) studies. The morphology of the stenoses is presented in Table 4. A benign configuration (Fig 6) occurred in 22/30 patients (73%), and aggressive features (Fig 7) occurred in 5/30 patients (16.7%). The length of stenoses was ≤0.5 cm in 35/70 (50%) lesions, >0.5–1 cm in 23 lesions (33%), and >1 cm in 12 lesions (17%). The percent stenosis was <50% in 9 (13%), 50%–75% in 32 (45.7%), 75%–90% in 4 (6%), and 90%–99% in 25 (36%) lesions. The mean stenosis was 71% (SD, 22.4%). Time-of flight MIP oblique view demonstrating distal involvement of the postbifurcation M1 and proximal M2 segments. There is eccentric, irregular narrowing with alternating stenosis and dilation consistent with beading (white arrowheads). “Aggressive” features are said to be the hallmark of vasculitis but were seen in only 11% of our patients. Multiple additional stenoses are present within the left M2 and P2. There were 4 patients with occlusion, and 2 with aneurysms. One patient had an isolated occlusion. Two aneurysms were detected in 2 patients. One patient had 2 focal dilations of thalamostriate perforators arising from P1 with an otherwise normal MRA. These were considered as one lesion. The other patient had an aneurysm of the P2 segment of the left PCA in association with both M1 and P1 stenoses. Forty-two patients had MR imaging and MRA at diagnosis. Of 175 MR imaging lesions, 126 (72%) were accounted for by the MRA abnormality. Similarly, in 30/42 patients (71%), the MRA abnormality was in the same distribution as the MR imaging lesions. The sensitivity of MRA in detecting MR imaging abnormality by patient (not lesion) was 72%. Five patients, however, had bilateral abnormalities on MRA with only unilateral MR imaging changes. Twelve patients (28.6%) had an MR imaging abnormality with normal vessels on MRA. On the assumption of the MRA findings as the reference standard, MR imaging was abnormal in 67/76 (88%) correspondent vascular territories and was normal in 9/76 vascular territories (12%). Because all patients had abnormal MR imaging, the sensitivity by patient was 100%, and the specificity could not be assessed. The agreement between MR imaging and MRA for abnormality was statistically significant (P = .04). This study is the first comprehensive analysis of the radiographic appearance of cPACNS. Although there have been numerous publications on PACNS in adults,2–9,16,17 the data in children in are limited. Previous studies in the literature have reviewed <25 cases.18–22 Our study demonstrates that the most common vascular involvement is unilateral, proximal, anterior circulation with multifocal parenchymal lesions within the lenticulostriate distribution. MR imaging is abnormal in all cases, with a good agreement within the distribution of MRA abnormality. The diagnosis of cPACNS in our study was established by a combination of clinical and laboratory features defined above and abnormal CA.4,9 Four patients were excluded from this cohort because of normal CA despite biopsy-confirmed small vessel vasculitis. These patients are described elsewhere.10 Many confusing terms have been coined to describe various clinical presentations of vasculopathy with emphasis on whether the disease is proved by biopsy or angiography and the presence or absence of progression.14–17 The gold standard in adults remains biopsy, which in adult PACNS frequently demonstrates granulomatous and/or lymphocytic inflammation of the vessel wall.9 Similar histologic findings have been seen in children, though brain biopsy is rarely performed in this age group.1,16–25 There are a number of reasons to question brain biopsies as the gold standard for cPACNS. Autopsy reports confirm that children and adults with CNS vasculitis may have normal leptomeningeal biopsies depending on the area of biopsy. They may or may not have involvement of different size vessels. Therefore nonlesional leptomeningeal biopsies may not confirm the diagnosis of CNS vasculitis either. In our experience, children with large vessel inflammation have inconclusive brain biopsies not demonstrating inflammatory vessel wall infiltrates. T2-weighted (A) and FLAIR (B) MR imaging demonstrating focal hyperintensity within the cortex of the postcentral gyrus (white arrow). There is widening of the adjacent sulci providing further clues to previous infarction here but the signal intensity abnormality may be overlooked owing to the adjacent CSF hyperintensity. A small subtle lesion is present within the ipsilateral posterior frontal lobe cortex (black arrowhead). Both the lesions are readily visualized on FLAIR imaging (B). 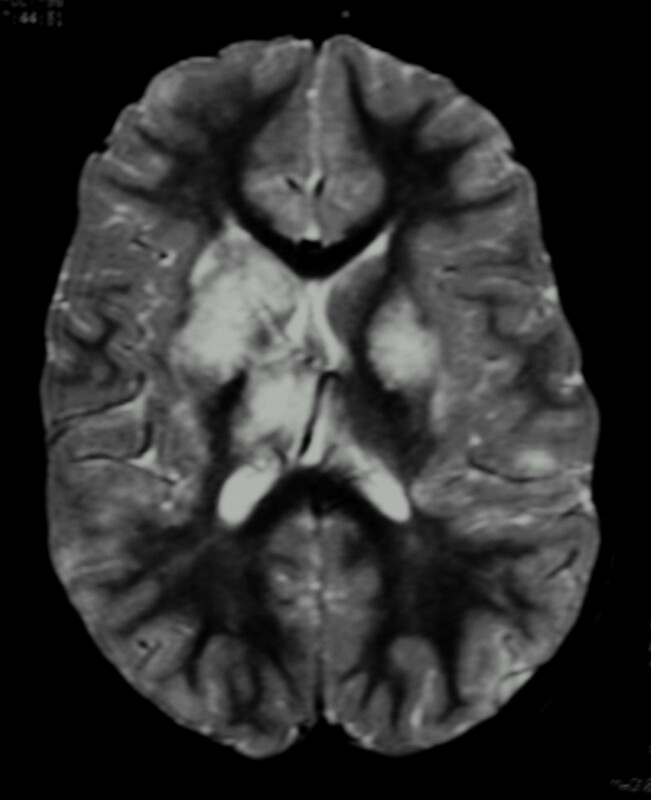 We have demonstrated overall involvement of the gray and white matter in equal proportion similar to the findings of Pomper et al.2 We detected no ACA territory abnormality, despite reports of 6%–86% involvement in 2 other series.2,5 Possible explanations for this include technical factors, because where a lesion involved mainly the MCA territory and extended into the ACA territory it was classified as an MCA lesion. Also, strict adherence to vascular atlas anatomy may not take into account variations in the arterial supply of individuals. Finally, most ACA involvement on MRA was confined to the A1 segment. A patent ACA may protect the distal territory from ischemia via the contralateral ACA supply. The 2 largest pediatric series describe parenchymal hemorrhage and subarachnoid hemorrhage in 20% (2/10) of cases.19,21 It is unclear why we had no cases of hemorrhage and why hemorrhage occurred less commonly than in adult series.2,5,6,8,21,23,32,33 Hemorrhage, which may be parenchymal or subarachnoid, is considered secondary to aneurysm or vessel rupture.34 The 2 aneurysms identified in our series were presumed vasculitic because of their nonsaccular appearance and origin distal to bifurcations. Numerous techniques have been applied to improve the sensitivity of MRA to detect CA-detected arterial abnormalities in patients with nonvasculitic steno-occlusive disease.37–42 The sensitivity for occlusion has been reported to be as high as 100%39–41,43 but is lower (86%) for stenosis >50%. The limitations of MRA are well described and include relatively low resolution and dephasing secondary to turbulence or in plane flow.41,44 MRA was unable to assess the MCA beyond the proximal M3, ACA beyond the proximal pericallosal artery, and PCA beyond the proximal P4 segment; however, the MRA lesion detection concurs with adult CA series, where 16%–40% false-negative rates are described elsewhere.3,45–50 Limited pediatric CA data are available, because angiography has not been a focal point,19 nor has study been limited to PACNS.22 Explanations offered to account for the low sensitivity in adult series due to temporally remote MR and CA studies do not apply in our series, because both studies were performed on the same day. The distribution of vascular abnormality broadly paralleled that of MR imaging abnormality. The MCA territory was most commonly affected (51%). The lesions were predominantly unilateral (80%), <1 cm in length (83%), and comprised multiple isolated stenoses of several vessels (63%). This varies from previously described findings in adults of multiple bilateral segmental stenosis.8,9,22,27,28,35 Of the 2 pediatric series, Gallagher et al21 describe bilateral abnormality on CA in 40% of patients but did not give a qualitative decryption of the stensosis. Chabrier’s series of 9 patients,22 including 5 with antecedent varicella zoster before stroke, describes multifocal lesions with unilateral involvement in 89% of patients. Although seen in only a minority of patients, beading (11%) was more common than multiple lesions of a single vessel segment (6%). Vascular occlusion was the least-specific finding and more frequently occurred in association with stenosis (75%) than as an isolated finding. Smooth narrowing of the supraclinoid ICA, commonly seen by others,2,7 was seen in association with proximal MCA and ACA involvement in 58% of our patients. Classic findings of angiitis (labeled as “aggressive” lesions in this study) were found less frequently than on CA in pathologically proved adult PACNS (25%–37%).1,8 More commonly lesions were “benign” in appearance on MRA. The difference may relate to the differences in definition or a reduced ability for MRA to detect aggressive features compared with CA. We found a sensitivity of 72% for MRA in detecting MR imaging abnormality. Conversely, MR imaging was abnormal 88% of vascular territories detected by MRA. Overall, we found the correlation of MR imaging abnormalities with MRA was statistically significant. Previous reports in adult CNS vasculitis reported agreement between MR imaging and MRA or CA and MR imaging of 65%–89%.2,5,34,36–42 It is logical that the agreement between modalities is imperfect and that MR imaging and MRA or CA may reveal abnormalities that are not present on the other technique. Explanations include MR imaging gliosis from a previous healed vascular insult, parenchymal vasculitis associated with subangiographic-diameter arterial lesions (“small vessel” vasculitis) or a new vascular lesion that has not yet caused a parenchymal abnormality. In addition, the limitations of MRA in the visualization of minor stenosis may contribute to the borderline value of agreement between these 2 modalities. MR imaging was abnormal in all patients at diagnosis. The lesions were most commonly supratentorial and multifocal and tended to be unilateral. 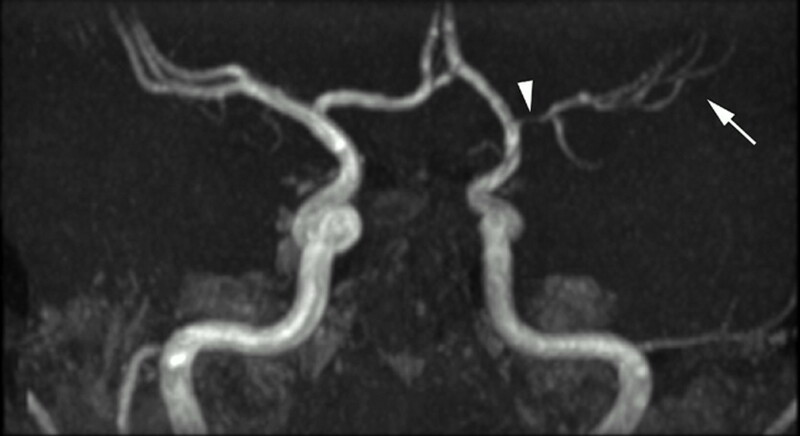 The finding of abnormal MR imaging in all patients is consistent with another study in adults in which a negative MR imaging study was shown to have a strong negative predicative value for the exclusion of CNS vasculitis.4 There are, however, proponents who question the sensitivity of MR imaging and advocate the de novo use of angiography in the context of a clinical syndrome consistent with vasculitis.8 Alhalabi described normal MR imaging in 21% of patients in the context of angiographic and biopsy-confirmed vasculitis. These authors reported that MR imaging consistently showed fewer signal intensity abnormalities than detected angiographically. Like many others,2,5,6 they did not perform routine FLAIR or DWI imaging that increase sensitivity to periventricular/subcortical and acute lesions respectively2–6 (Figs 1 and 8). Furthermore, a recent study in adults51 confirmed the poor specificity of angiography against biopsy with 0/14 cases with angiographic features typical for vasculitis demonstrating biopsy proof of the condition. We found that MRA lesions correlated well with MR imaging abnormality. A small study of 7 patients with PACNS reported that the combined sensitivity of MR imaging and lumbar puncture was 100%.7 We suggest that in the presence of clinical and laboratory features of cPACNS an MR imaging scan (with FLAIR and DWI) is at least as sensitive as angiography and represents the best screening tool, though serial scans may be required. In addition we suggest that in the face of repeatedly negative MR imaging scans vasculitis is very unlikely. We have demonstrated the MR-MRA pattern of cPACNS at diagnosis in a large pediatric cohort. The findings differ from adult PACNS in that the most common abnormality is unilateral, proximal, multifocal, and supratentorial. There is similar involvement of gray and white matter overall but a strong tendency toward central lesions involving the basal ganglia or lateral lenticulostriate vasculature territory. A normal MRA study did not exclude the diagnosis of vasculitis, but all patients had an abnormal MR imaging finding at diagnosis. The most frequent MRA finding is a benign appearance with proximal involvement of the carotid termination and proximal ACA and MCA segments. The agreement between MR imaging and MRA is good but imperfect. The diagnosis of cPACNS continues to represent a challenge and requires close clinico-radiologic collaboration. Repeat MR imaging should be offered as an alternative to CA in the context of clinically suspicious cPACNS as, in the presence of repeatedly negative MR imaging studies, vasculitis is very unlikely. The authors would like to thank Faisel Ahmed for his assistance in data collection and data base administration and Eshetu Atenafu for statistical support. Accepted after revision June 6, 2005.